The heroes of the Indian football team return from the AFC Asian Cup as the ongoing season of Hero Indian Super League – season 5 resumes on Friday, January 25th with arch-rivals Kerala Blasters locking horns against the two-time champions ATK. After a morale boosting AFC Asian Cup, the Blue Tigers have now returned on the home soil to don their Hero ISL franchise colours aiming further to win fan’s hearts from across the country. 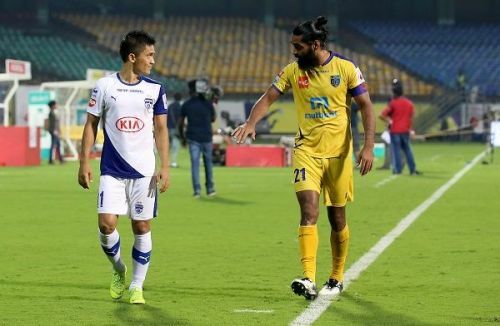 The opening three games of the Hero ISL season after the break will see stars from national team Sunil Chhetri, Gurpreet Singh Sandhu, Udanta Singh (all Bengaluru FC), Anirudh Thapa (Chennaiyin FC), Rowllin Borges (NorthEast United FC), Subhasish Bose (Mumbai City FC), Pronay Halder (ATK) and many more back in action for fans to look forward to. Bengaluru FC narrowly missed out on the Hero ISL title last year and are unbeaten after 11 games, with this form the team could very well be the champions this season. The current standings in the league table also indicates that the league could have a new winner with Bengaluru FC, Mumbai City FC, FC Goa, NorthEast United FC and Jamshedpur FC all in contention for the playoff spots. Star Sports 1/HD, Star Sports 1 Hindi/HD, Star Sports 3, Star Sports 1 Tamil, Jalsha Movies/HD, Asianet Movies, Raj TV, Colors Kannada Cinema. All the action from #HeroISL 2018-19 comes to you LIVE on @StarSportsIndia!